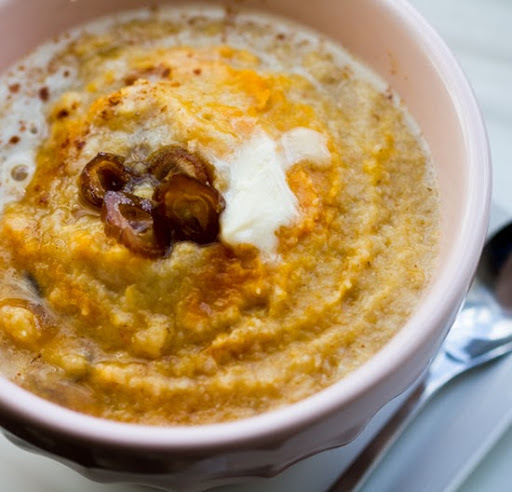 Bringing Cream of Wheat Back: Pumpkin Spice Swirl. What ever happened to Cream of Wheat? Where did my favorite childhood hot cereal bowl, brimming with American nostalgia go? I take a historic look at Cream of Wheat cereal and try to give my bowl a seasonal, foodie-approved makeover. I'm Bringing Creamy Back. 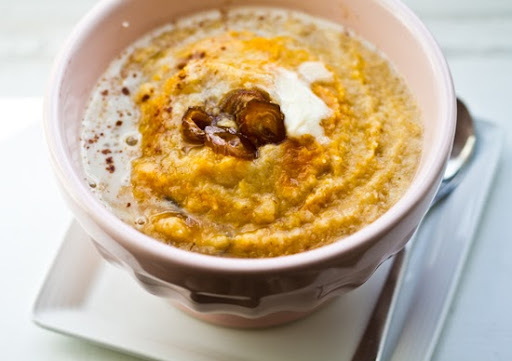 For my Cream of Wheat makeover I added in a swirl of pumpkin, a drizzle of maple syrup, some sweet and chewy sliced dates, a dash of cinnamon, a dollop of vegan buttery spread and a splash of soy milk. Maybe Cream of Wheat can make a comeback after all. 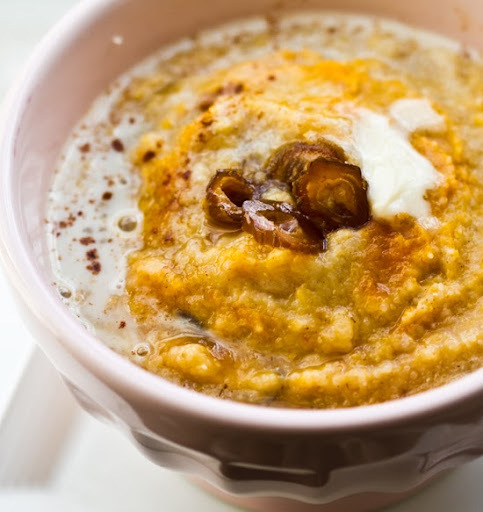 My fall-inspired recipe and a look back..
Oatmeal has all the Fun. 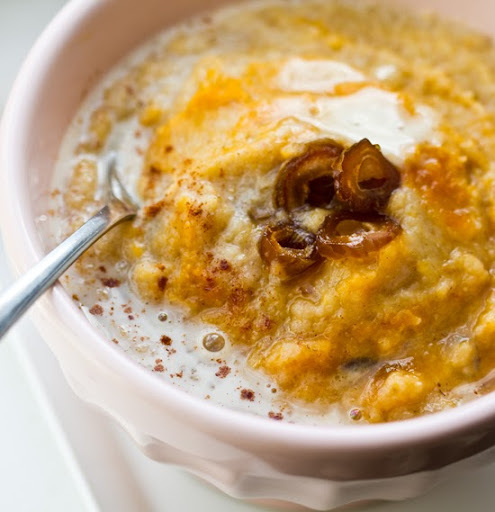 Pop open any breakfast menu (from shabby to chic) and you are sure to find oatmeal - but rarely Cream of Wheat hot cereal. Oatmeal is found on menus as casual at Starbucks (price: a few bucks) to as fancy as Norma's at Le Parker Meridien NYC who serves McCann’s Irish Oatmeal Brûlée with sautéed green apples and red pears (price: $16). Despite the fact that oatmeal is a very rustic food in its purest state, it has easily been glammed up for foodie-worthy menus. So why can't I glam-up Cream of Wheat? 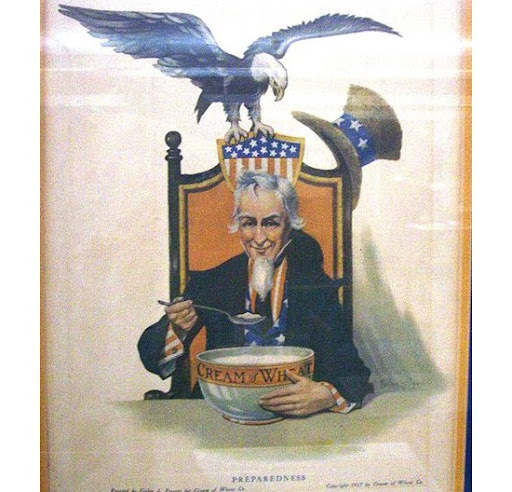 ..Especially when Cream of Wheat hot cereal is an American classic. Classics never go out of style, right? Cream of Wheat: American Classic..
"In 1897 the demand for “Cream of Wheat” had completely outgrown the producing capacity of the small plant at Grand Forks and the business was moved to Minneapolis"
"Many of the most famous American artists of the “Golden Age of Illustration” were commissioned by the Cream of Wheat Corporation." 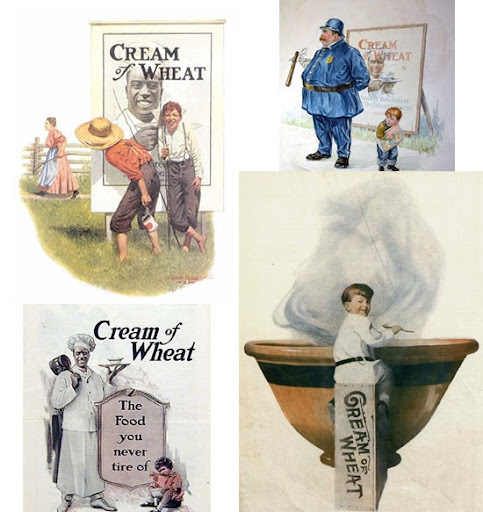 - history of Cream of Wheat. 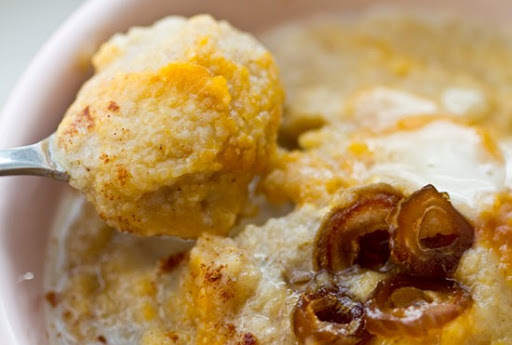 Flashback: Cream of Wheat Mornings. In my house growing up it was my dad who ate the oatmeal. He'd go through entire barrels of the stuff all by himself. While the girls of the household had a strict loyalty to those sweet, silky, steamy bowls of Cream of Wheat. Lumps were a tragedy, but I secretly liked them once in a while. My mom would prepare our bowls with milk and cereal. Then my sister and I would add a small dollop of margarine and a big spoonful of brown sugar. I'd add an overflowing handful of raisins - because I loved how they'd plump and become soft when mixed with the hot cereal. Our breakfast was served with a glass of OJ and a few slices of toast with raspberry jam. That's how I remember hot cereal as a kid. But it seems somehow, Cream of Wheat lost its mark, fell off the foodie radar and became even too low-brow to be considered rebelliously-hip. And I admit, that I eat more bowls of oatmeal than bowls of cream of wheat. Probably because oatmeal is higher in fiber and less processed than Cream of Wheat - and so for me, the healthier hot cereal wins its spot at my kitchen table. 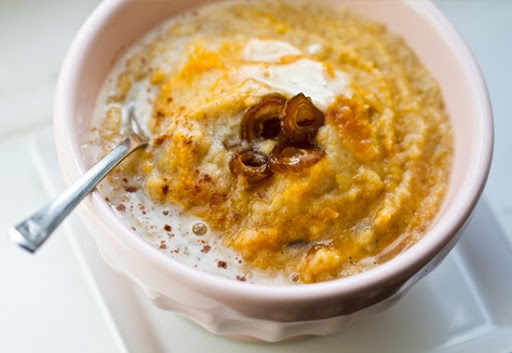 But every once in a while I get a craving for Cream of Wheat and so here is my fall-twist on my classic creamy cereal bowl..
1. Bring your water and milk (2 cups total) to a boil. Add the salt and cream of wheat. Constantly stir gently. Bring to a strong boil, then reduce heat to medium. 2. Continue stirring until the cereal thickens. At this point you can stir in the cinnamon, dates and maple syrup. If you desire a thinner cereal, add in additional soy milk. Thicker, add in more cereal. 3. When cereal has cooked into a thick, hydrated consistency (like thick applesauce) turn the heat to low. 4. Stir in the pumpkin over low heat. You can either stir it in completely - or you can leave it swirled gently into the cereal. 5. Turn off heat and spoon cereal into bowls. Add a pas of vegan buttery spread, a dash of cinnamon and a splash of milk on top. Add a few leftover chopped dates as garnish.